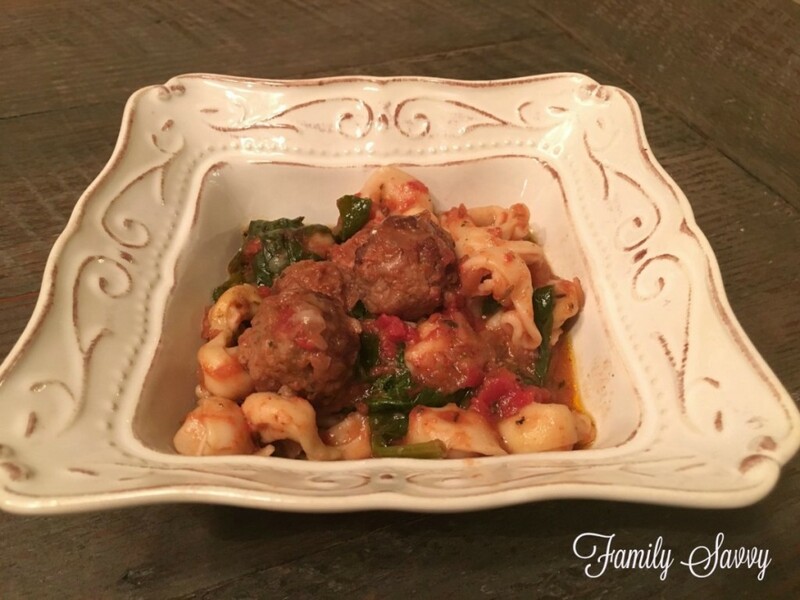 This easy Italian meatball soup is rich, delicious and EASY~using frozen meatballs to cut prep time in half. This recipe is an adaptation of this fabulous Italian Sausage & Tortellini Soup, literally one of the best soups I’ve ever eaten. I wondered if a meatball version of the fab soup would turn out yummy, and it did! I served this alongside spaghetti to my daughter and her basketball team. They devoured it, and many went back for seconds. It was a hit. Since I wanted to create an yummy soup that was easy, making homemade meatballs was out of the question. I decided to use Trader Joe’s cocktail meatballs since I had them on hand and because I like their small size. They worked beautifully! If you live near The Fresh Market, it has several of the key ingredients easily accessible. The Parmesan rind is key, and TFM has rind-on parmesan chunks in the deli cheese case for only a few dollars. They also sell the red wine in small bottles near the register. Either the merlot or cabernet sauvignon is perfect.The Drake’s cheese filled tortellini is in the freezer case. It is my favorite cheese tortellini and comes in a box that has enough to make 2-3 batches of this soup. There was just enough soup left over for two small bowls the next day. Jud and I ate it for lunch, and it was as good or better than the day before. This is definitely a keeper of a recipe for us. If you try either of these tortellini soups, please leave comments with your opinion! I love love hearing your thoughts as well as your suggestions. As always, thanks so much for stopping by. Be blessed, and stay savvy!!! This soup is rich, savory and delicious. Don't tell anyone you used frozen meatballs (they will never know). Heat 2 TB oil in skillet over medium heat. Add frozen meatballs; sprinkle with Italian seasoning. 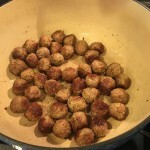 Cook until meatballs develop a slightly brown, crusty exterior. Add 2 TB oil to Dutch oven; heat over medium heat until sizzling. Add the onions; sprinkle with sea salt & pepper to taste. Allow the liquid to cook out at a rolling boil. Add the chicken stock, balsamic vinegar, brown sugar, Parmesan rind, and meatballs. Add tortellini; cover pot and allow to simmer on low for 5 minutes. 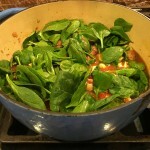 Add spinach to the pot; cover and simmer until wilted (2 minutes).